Got down to Hampton at about 3:45 and a good wind was blowing at last. There has been a lean spell of good wind over the last fortnight or so. There were about a dozen kites out and quite a few pole dancers (windsurfers). The vibe was good and everyone was having a good time. I kited upwind to the marina breakwater in a moderate swell and did some fast runs on the flat water inside, but the Southerly wind dropped out a bit behind the marina, so this was not a great place to be. I then did some very fast runs back to shore. No GPS but they were definitely quick. I did a few jumps on the left tack and found it quite easy to get some air. About halfway through this session I dunked the kite attempting a kite down turn and it inverted. I could relaunch it but it flew with a wrap on the leading edge, not generating much power. After a period of dragging back to shore I tried some kiteloops which got me up an going. After putting the kite on the water I successfully sorted out the inversion by pulling in the front lines and got up and going again, with one outer line twisted over a rear line. I returned to shore to sort this out. I tried carving among the waves both out an in, arcing the board to accommodate peaks and troughs, which worked well. I was not feeling to confident toe down riding - this needs more practice. No backrolls yet either. But I did get some big air and landed fairly well. Only one thud when the kite flew back too far. There were plenty of jellyfish about but they were mostly well under the surface. I didn't get stung by any. 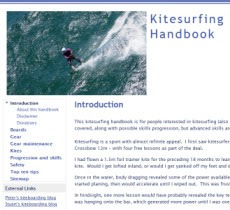 I finished the session with some kiting in the 0.3m swell that was breaking onto the shore. All in all a really enjoyable session. The forecast was for a strong southerly all day, and blow it did. I packed my kiting gear in the car and parked near Burnley railway station so I could duck out after work. I got to the beach with the wind blowing at around 25 knots so it was an easy decision to take out the 10m kite. This was my first return to St Kilda after my earliest learning periods, during which I never really got to kite their properly. After negotiating some learners close to shore I got out into the largish swell and headed out about 800m. Nice scenery looking back at the shore. After a couple of tacks I was at the breakwater, with a few large jellyfish about. I was able to kite into the flat water behind the rock wall with the wind still pumping over it to power my kite. Then I scooted just downwind of the permanent moorings, passing a couple of yachts on swing moorings, to the flat water close to shore. There were about 8 other kiters in this fairly confined space but they all knew what they were doing. Even so, it pays to watch your kite closely and make sure you dip your kite down when you pass downwind of another kiter; who should fly their kite high. There was a small surf where the swell gets under the pier so there is a mix of flat water and some rolling waves. They are big enough to snag your board if you don't watch out. I did a few jumps, but was mainly focussed on keeping the kite flying and not wiping out. It really is a blast coming into shore then fanging back out. I did a run downwind past the learners, then repeated the circuit out to the breakwater and back in, which is a fun loop. My board snagged a wave and I tumbled off it. Body dragging upwind was not too effective (kite too low?). When I got close to the board I threw the bar than swam a few strokes to get it. Relaunching the kite I discovered that one side of my spreader bar had released from the harness so the depower lines were pulling me sideways. It was tricky to reconnect the bar while hanging on to the board and contending with the small surf. Eventually I got it sorted and did a few runs then headed back to the beach. The Switchblade 10m kite doesn't seem to want to flatten onto the water and is a dream to relaunch. Tip: make sure your harness is done up well and the spreader bar is tight - reef in the webbing to do this. It will loosen up a bit when it gets wet too. The wind strength increased to a powerful 28 to 30 knots, enough to make me consider depowering the kite. I landed and returned to the car, with the wind whipping sand off the beach. After getting changed hastily I proceeded to a Bush Search and Rescue committee meeting and dinner in Williamstown. I had been considering kiting across to Williamstown, but was glad I didn't. The swell was even bigger when the wind strength increased and it would be a long tack over big waves to get over there. The landing sites along the Williamstown foreshore are very limited so I was considering heading for one of the beaches on the southern side of the promontory. This trip is on the list of things to do - but with a buddy, a phone and a PLB. Overall a good session - quite challenging but very rewarding. Returning to the inlet, the wind was stronger than when we had left. 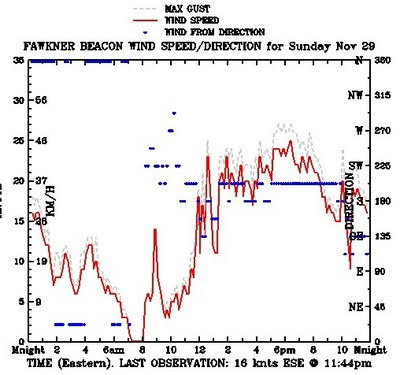 White capped waver were prominent and the wind right on the launch site was gusting up to 42km/h. Stuart and Tarren helped me launch the Crossbow 7m kite for another trial run. I depowered the kite a little as there was too much power at times. The kite flew very fast in the strong wind which was still very gusty. Crossign to a sandbar I was tempted to go right across, but the waves on the sandbar were very choppy and there was only one windsurfer about and no kites. I did several runs back to the beach and managed a few reasonable jumps. I also attempted a few transition turns, finishing the jumps and entering into the turn. It was not a day to be too adventurous however, as a crash would mean a wrecked kite, a long swim, or both. Just after Stuart caught my kite, the wind appeared to increase by another 5 knots, so I was happy to stop. This left one keen windsurfer on the water who was also struggling with the conditions. Overall, a really good session for honing skills for coping with extreme conditions and having a bit of fun. However, it was difficult to get much speed due to the chop in the water. Here is the wind observations at Wilson Promontory around the time of this sesion, which would be more exposed than Inverloch. The forecast was for good wind today, and it was blowing in the morning. Stuart, Tarren and I went down to Pensioners Point in Anderson Inlet and checked out the surf beach too. We decided to give Pensioners a try as there were more options there. Rigging up, the wind was coming from the west (off the land) and swirling about dramatically. 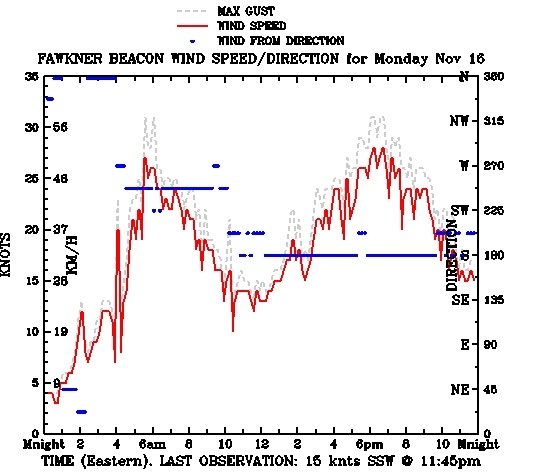 It was also gusting up to over 30 knots at times. I decided to give the Crossbow 7m a go due to the high wind speed. Stuart and Tarren looked on. The channel was not flowing very quickly. There was more than enough wind to power the 7m kite. I did several runs to a sandbar across the channel and back, managing to stay a little upwind. I was very wary of crashing the kite as once over the other side, it would be very difficult to get back. The wind gusts were dramatic, but the superb de-power of the Crossbow enabled me to handle them. Then the wind dropped, so I did some runs downwind across the channel up into the inlet. I passed the jetty and was over the other side, sizing up a run back to the kite beach when my kite inverted on a turn and crashed. I think there was a hole in the wind right when I was turning the kite which contributed to the problem. The kite crashed and flopped like a jellyfish, with me drifting towards a large sandbar in the middle of the inlet. I kept reefing in the lines and eventually relaunched it with the front and rear lines crossed once. I walked along the sandbar then kited back to the beach on the town side, relieved that a major epic was avoided. Stuart and Tarren arrived in the car, with the bad news that my kite bag had disappeared from the launch site, presumable blown into the inlet. This was a problem as it had my car keys in it. Tip for the day - always weigh down gear with a lot of sand. Then a huge stroke of luck. A French kiter came up with the bag, saying a windsurfer had found it floating nearby in the inlet, about 2km from our launch site. Amazingly, the keys were not wet. Stuart then had a go of the 7m kite, followed by Tarren. Both enjoyed the session but remarked on how variable the wind was. At least we got some use from the 7m kite, which most of the time sits in my "quiver" idle. There were about another 6 kiters out at this time, going right across the inlet, mostly on 9m kites. The wind had backed off a little in strength but was still very gusty. We decided a break for lunch was in order so we returned to the house. 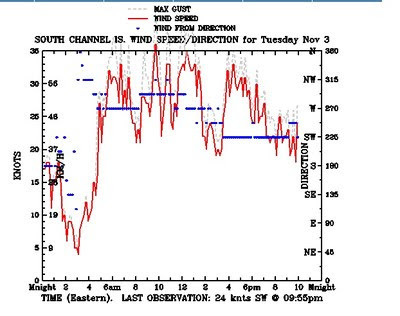 Here is the wind chart for South Channel to illustrate how gusty the wind was there.